Hello you all from here. When you download and setup everything as i will list below, you can play every game to the end with minimum or no lag (Just make sure you have nothing using your internet, especially your upload). 2 - Download Emulator http://sourceforge.net/projects/zsnes/f ... esw142.zip - ZSNES v1.42 (Compatibility) put it in a new folder and create a folder inside it called "Roms"
Obs. : Only open the emulator to change the controls (use Input 1) and to change the resolution (if you want), thats all. Don't mess with anything else. 3 - Open Z-Net, configure the paths of zsnesw (emulator) and Roms Folder. You will select the roms inside the Z-Net by creating a room, and the emulator (Zsnes) is automatically opened as you press Start. Ports are a way to make connection for some programs. Most programs that uses Ports can setup it automatically inside your modem\router (Like Skype). But in this case you need to do it manually. It has no harm or anything that will cause problem to you. All you need is to know how to enter inside your modem/router configurations, your local IP (the ip your modem provide to your PC) and to find the place to add Ports inside the Modem. 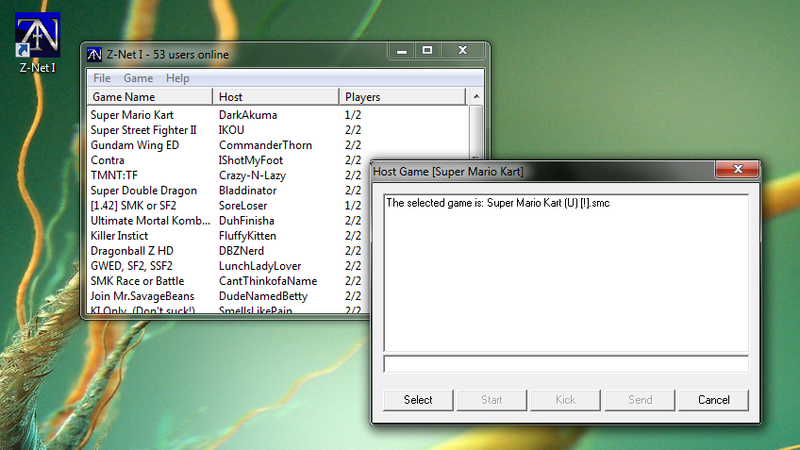 After that, just Create a room and wait for someone to enter, or join a room, you can download the roms from hosts. If you are a host, just leave the option "Disallow download" unselected. - Don't need to leave the emulator opened, the Z-Net will open it and do the rest to connect. - Do not rename the Roms! - Do not use fast forward button. - Don't play doing alt tab, it can accumulate lag and delay. - To talk while playing press "T"